Frankincense Essential Oil has a warm, pungent, sweet smell. 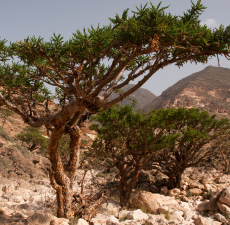 The Frankincense tree is a scraggly but hardy tree which originates from Oman and the Middle East. By slashing the barks of the tree, a sticky, fragrant resin is produced from which the Frankincense Oil is derived. Frankincense Essential Oil is highly prized in the perfumery industry and in Aromatherapy. It is widely used in skincare products’ manufacturing as it is considered a valuable ingredient having remarkable anti-aging, rejuvenating and healing properties. The scent of Frankincense is stimulating, helps in overcoming stress and despair, elevating the mind, and is also believed to encourage a meditative state, bringing balance and peace to individuals. Incense has been traded for 5,000 years, was widely used in ancient Egypt, and one of the ingredients of the holy oil in the Talmud. Frankincense was brought back to Europe by Frankish Crusaders (Frank-incense). Its resin is known as olibanum, derived from the Arabic al-luban or 'that which results from milking', referring to the milky sap tapped from the Boswellia tree from which the resinous tears are obtained. Frankincense Essential Oil is non-toxic, non-irritant and non-sensitizing. Avoid use during pregnancy.